Overhauling the payment and management of village court officials across the nation is a “mammoth task”, according to Bruce Didimas from the Department of Justice. 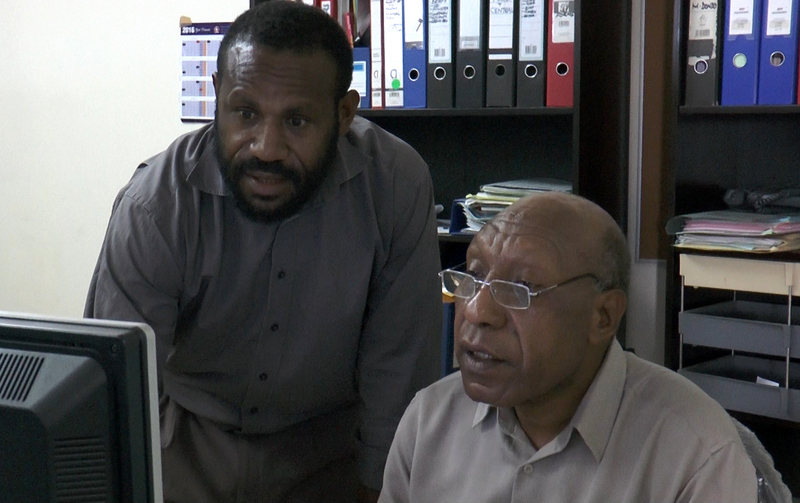 But it’s one that he has been able to tackle more confidently since completing a Diploma of Government (Management) course at the PNG Institute of Public Administration (PNGIPA), facilitated by the Pacific Leadership and Governance Precinct. Mr Didimas is the Assistant Manager for the Highlands and Momase Regions at the Village Courts and Land Mediations Secretariat. He is responsible for providing advice, standards and guidelines for provincial administrators and village court officers, and guiding his Port Moresby-based staff to implement a range of new systems. He graduated with a Diploma of Government (Management) in December 2015, and is now supporting colleagues and departmental management to oversee huge changes in how village courts are run. “We have come up with new guidelines and standards for the payment of village court allowances,” Mr Didimas explains, amid a hive of activity in his office as staff prepare for a wide-ranging inspection program of village courts. Another major barrier to the functionality of village courts has been long-standing confusion about the respective responsibilities of village, district, provincial and national administrators, Mr Didimas says. In response, he has used knowledge from the Diploma to draft and implement village court service charters that clarify roles, responsibilities, payments, and chains of command. “Now the provincial officers know what we are supposed to be doing, and who to see at each level,” he explains. “Village courts belong to the community, to the people, and they serve the vast majority of the population. It’s a unique court system in the country, manned by people from the village and community leaders, according to custom. Senior Department of Justice staff have welcomed the innovations, according to Mr Didimas. Besides sweeping measures to improve the effectiveness of village court management, Mr Didimas has also implemented small but symbolic changes in his office. Before undertaking the Diploma, Mr Didimas and his fellow regional assistant manager sat tucked away in a back room, with junior staff occupying the front office and acting as the first port of call for visiting regional staff. Now, Mr Didimas and his senior colleague are the first faces to greet visitors. As the only member of his team to study for the Diploma of Government (Management), Mr Didimas is conscious of his responsibility to share his learnings with others. He says one of the most effective ways he has done this is through helping staff prepare for an ambitious inspection program of village courts in NCD and Central Province. He explains: “With the skills and knowledge that I gained from the Diploma of Government course, coupled with the experience that I have, we are mentoring our junior staff, training them, coaching them in how to plan and organise these inspections. The officers are very grateful because now they feel competent enough to go out and conduct inspections in the village court areas, and they are learning something. “Now, our officers are imparting that knowledge to all the village court officials, and telling them about the ethical standards that they must maintain as village court officials and leaders in the communities. These are the standards from our training guidelines and handbooks. Bruce Didimas studied for a Diploma of Government (Management) in 2015, delivered by Canberra-based CIT Solutions at the Papua New Guinea Institute of Public Administration, and facilitated by the Pacific Leadership and Governance Precinct. The Precinct is a joint initiative of the Governments of PNG and Australia to promote ethical leadership and strong governance within the public sector at the national, provincial and district level.